Learn how to effectively communicate in English and improve your conversational language skills. FREE ON-LINE COURSE! Sounds of Speech (English) mobile application. This site contains animations of the phonetic sounds of Spanish and English. 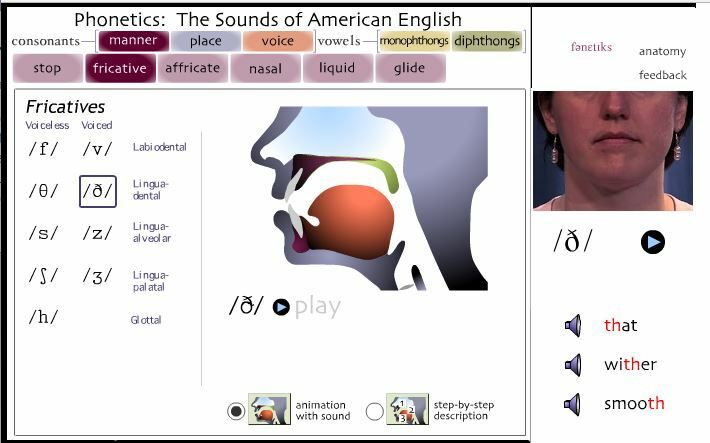 Available for each consonant and vowel is an animated articulatory diagram, a step-by-step description, and video-audio of the sound spoken in context. It is intended for students of phonetics, linguistics, and foreign language. Recently added to help fund further development you may buy an Android or iPhone Mobile app for English Phonetic Sounds of Speech. Use this to help learn the sounds of English. The University of Iowa displays English sounds by their phonetic symbol. Click on the symbol to hear how it sounds, see a native American English speaker pronounce the “letter” sound, see a graphic of how it’s made in the mouth or go to the description icon to read how to say the sound! The slides below were created through a free Linked In program that enables LinkedIn account holders to upload, download and share slides for personal, restricted or public use. The slides below offer an overview of how to teach English pronunciation skills. Reading2success: What? Yes, when r follows a vowel, r changes the vowel sound – R-controlled vowels! Below is just one of many activtities for teaching children how to pronounce the /r/ sound offered by the Reading2Success site listed below. Source: Reading2success: What? Yes, when r follows a vowel, r changes the vowel sound – R-controlled vowels! English language learners: Have FUN while you learn from this site’s interactive games and activities using real-life situations. If you like this English in Life site, please share it with your friends! I would like to ask you to share the poem below with as many people as you can so we can revive these principles and, in so doing, restore our country’s reputation as a place of refuge and where dreams are possible before it’s lost forever. I believe we need to understand what people experience, foster cooperation over competition, and allow everyone a chance to shine, discover their unique qualities while appreciating what others have to offer–whatever that may be. I also believe we should value all contributions and abilities, not only the “academic” skills so prized today. Artists, caretakers, entrepeneurs, nonprofessional athletes, plumbers, mechanics, actors, beauticians, servers, customer service representatives deserve just as much appreciation and admiration for what they do as we currently give to the people who earn 10x as much–or more. Please take time to thank those who give you joy and help you in some way–and to find out something about them. You may discover that you have something in common with them, learn something fascinating or make a new friend! This document is an excellent reference source for learning how to connect thoughts, subjects and statements together in speaking and in writing. It offers a list, which can then be used with an English language learner’s dictionary to find out how to use them correctly!